USDJPY is under the influence of 10-y Bond Auction in Japan and JOLTS Job Openings, NFIB Small Business Index and Whole sale Inventories m/m in the US. The chart is making a reversal after touching 105.537 and it is not a good time to complete it. 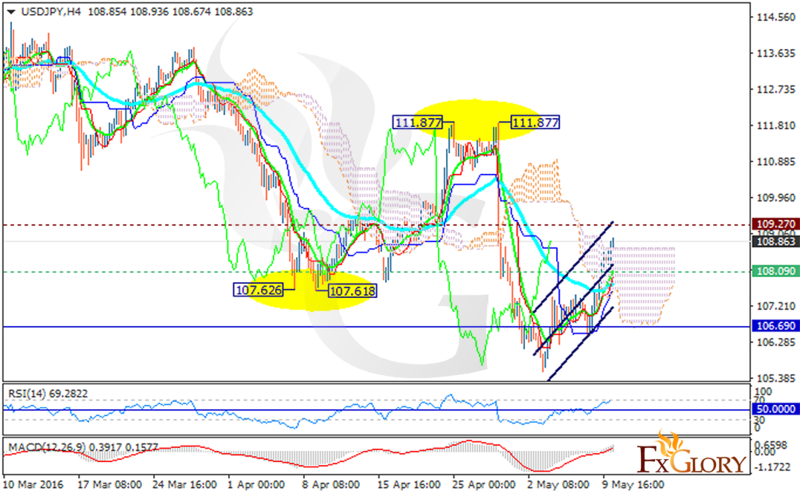 The support rests at 108.090 with resistance at 109.270 which both lines are above the weekly pivot point at 106.69. The EMA of 10 surpassed the EMA of 50 heading upwards. It seems that the pair is climbing up the ascendant channel. The MACD indicator is in positive territory showing the price growth and the RSI is above 50 level as well. The resistance level breakout will make the pair move in higher ranges. Concerning this scenario, the next target will be 109.80.